The photograph should show your full frontal face with clear facial features. The photograph should have a plain white background. The size of the photograph must be 40mm (width) X 50mm (height). The size from chin to crown for the person in the photograph should be 32mm to 36mm. There should be sufficient headroom. When you take the photo, please do not wear head dress, and avoid heavy make-up and overly dark or overly light-coloured clothing. Your photograph will be personalised on the data page of your passport or Doc/I by laser engraving. The quality of the image that appears on your passport or Doc/I will depend on the quality and colour of the original photograph you furnish. 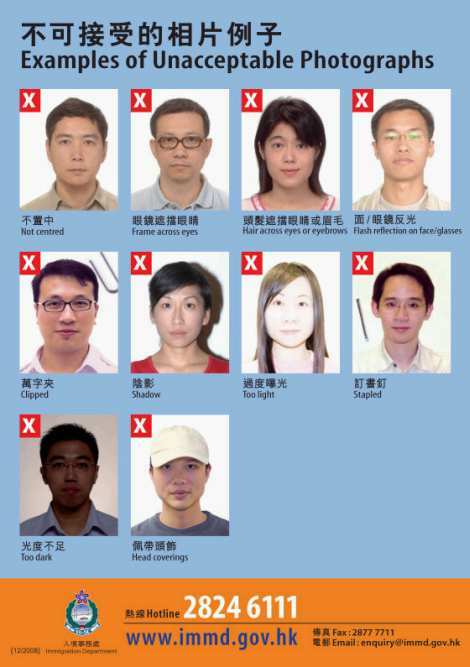 Please do not fold, staple, or write on the back of the photograph, or attach the photograph to the application form by paper clip. Otherwise, the photograph will become unsuitable for passport or Doc/I personalisation. 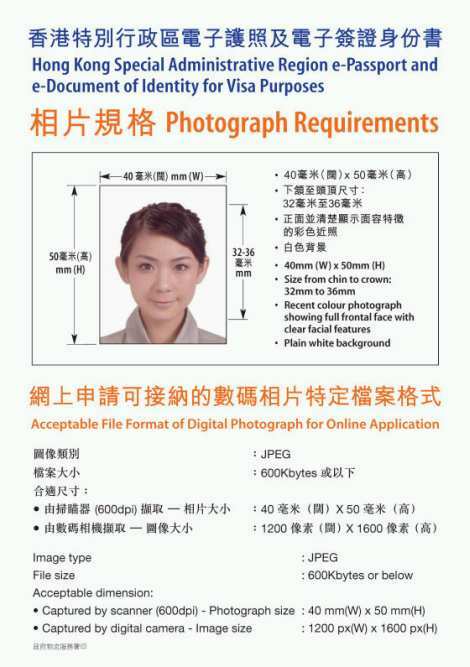 An application with a substandard photograph will not be processed and will be returned to the applicant.